Santa Cruz is one of the most celebrated and cherished surf meccas in the world. It is internationally renowned for its outstanding wave quality and consistency, cold-water marine environment, and passionate community support. 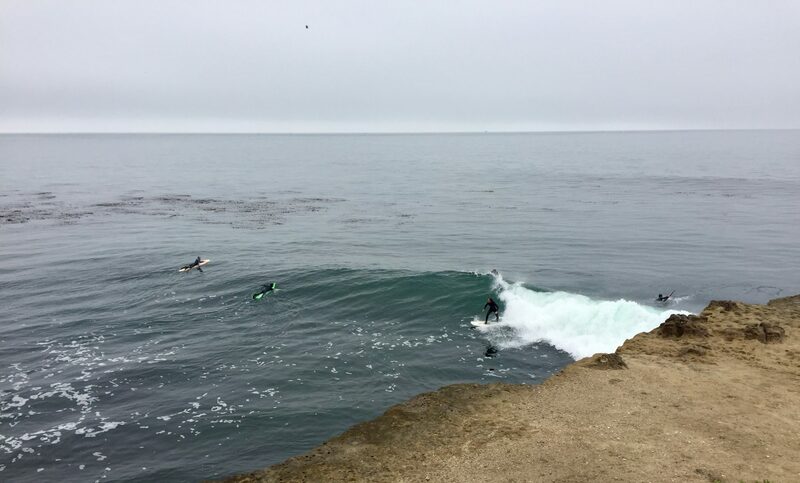 The Santa Cruz surf zone is designated as the area from Natural Bridges State Park on the west end to Opal Cliffs on the east end of Pleasure Point. It includes more than 23 surf breaks along the region’s coastline that people of all levels and ages enjoy throughout the year. This area’s rich surf legacy is preserved in the one-of-a-kind Santa Cruz Surfing Museum. Perched above the surf break of Steamer Lane, “the world’s first surf museum” is housed in the Mark Abbott Memorial Lighthouse at Lighthouse Point on West Cliff. 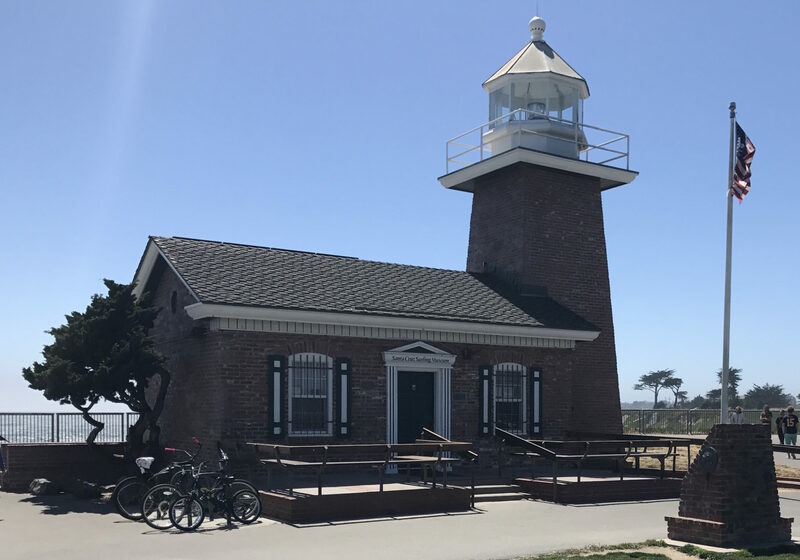 The brick lighthouse was built in 1967 in honor of Mark Abbott, a young local who drowned while surfing Pleasure Point. The memorial museum was established in 1986, and has become an iconic symbol for the Santa Cruz community, surf culture, and ongoing coastal programs. The museum covers early history of surfing through present day. Plaque dedicated to the Hawaiian princes who brought surfing to Santa Cruz in 1885. 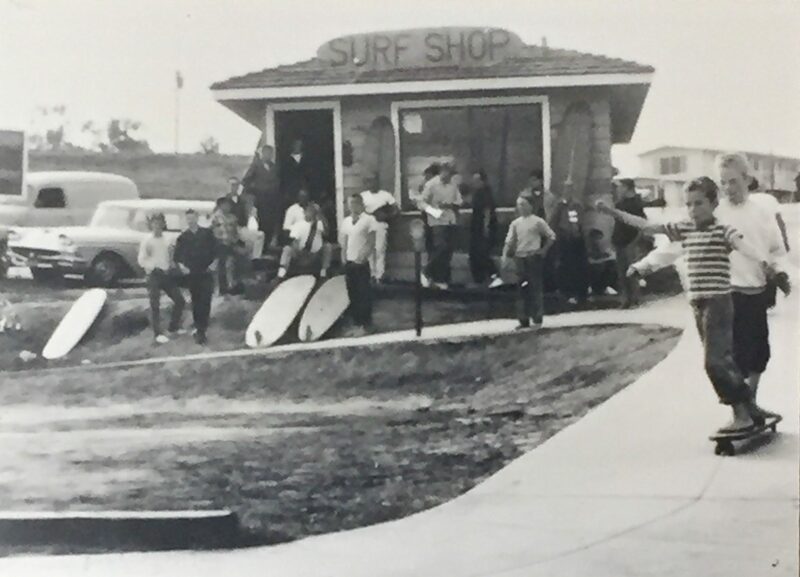 The museum spans 100 years of surfing history and culture in Santa Cruz and the northern Monterey Bay, beginning with the origins of surfing in ancient Hawaii. 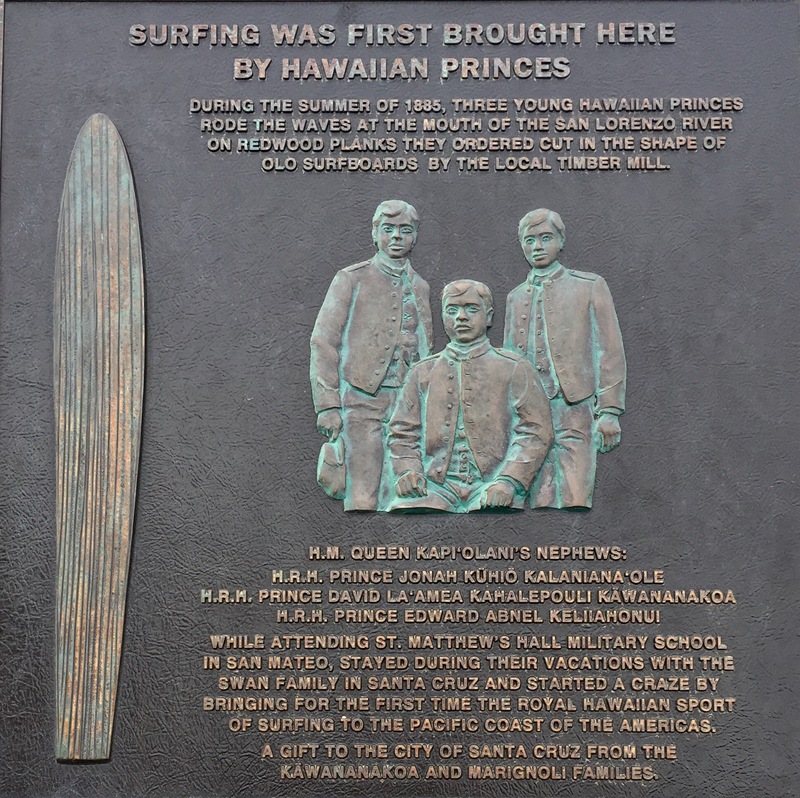 A plaque and images document the local lore of the three Hawaiian princes who first introduced surfing to Santa Cruz in 1885, after they reportedly surfed the San Lorenzo River mouth on locally milled redwood boards. 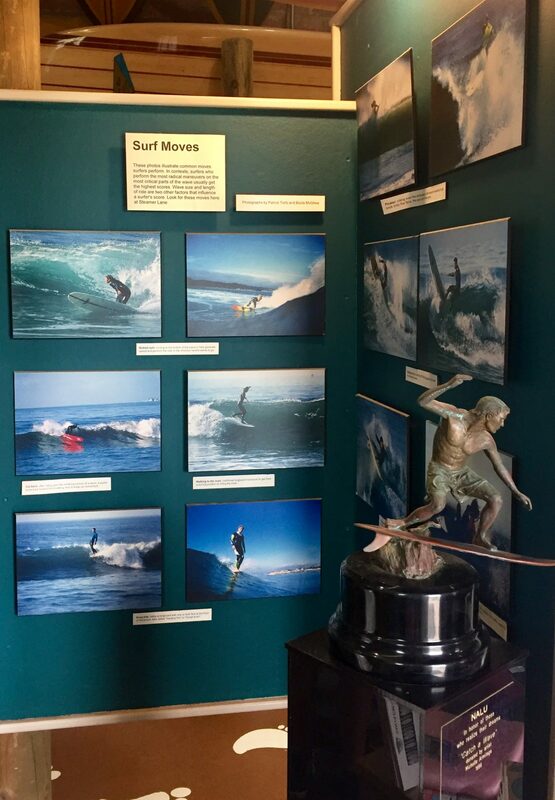 The small but well stocked space exhibits photographs, videos, and artifacts showing the evolution of local wave riding and surf-related materials. Images and information chronicle the popular culture of beach life that took form in the 1930s and continues to develop through present day. Surfboards from every era – ranging from early redwood planks to modern foam and fiberglass designs – are displayed along the walls and ceiling. 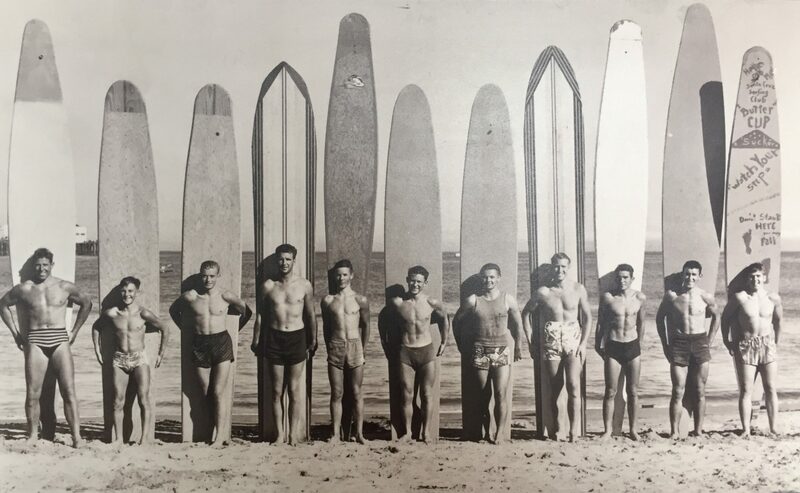 The museum spotlights legendary men and women who have played a pivotal role in developing surfing as an activity and industry in Santa Cruz and worldwide. The adjoining museum shop sells Santa Cruz and surf-related books and memorabilia, and although admission is free, museum donations go towards preserving this area’s unique surfing heritage. Jack O'Neill, inventor of the wetsuit, with his induction award for the Surfing Walk of Fame. The museum exhibits all forms of Santa Cruz surf culture. In 2012, local and international communities officially commemorated Santa Cruz as a World Surfing Reserve; a status currently shared with only eight other locations across the globe. Santa Cruz is located within the northern coastal waters of the Monterey Bay National Marine Sanctuary. The Santa Cruz World Surfing Reserve recognizes this area’s exceptional surf zones and surrounding environment, and works to protect it not only as a home for surfers, but also as a habitat for one of the most active ocean ecosystems on the planet. The museum proudly upholds and spotlights surfing as a central part of this area’s identity and local lifestyle. 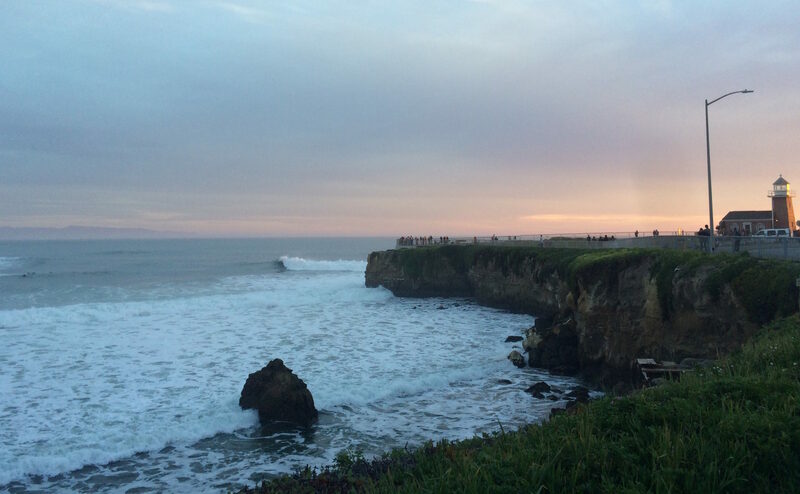 The Santa Cruz Surfing Club Preservation Society, California State Parks, the City of Santa Cruz, and individual donations also help maintain the cultural, historical, and environmental legacy that make this area a leader in the world of surfing.